Not open to the public. Tour and tasting by appointment only 7 days a week 10 a.m. to 5 p.m.
ARNS is located below Howell Mt. and above Meadowood County Club. We are the third owners of our property which was homesteaded in the late 1880's. The estate is 160 total acres but we only have 11 planted acres of 100% Cabernet Sauvignon. Our oldest vines are around 36+ years old. Our soils are very deep, well drained, Aiken series. Our winery was built in the mid-1980's. Our grapes were sold in the early days to Spring Mt., Dunn Vnyds, Cuvaison and Martin Ray. Today, our small winery houses aging 2014/2015 wines in 80% New French Oak barrels. Our wines are estate grown which means they are grown, produced and bottled on the property. We farm our land/vines organically. Our wines see 2+ years of barrel aging and are bottled with a mobile bottling line and held in our warehouse for two years before release. John Arns is our viticuluralist and Sandi Belcher is our winemaker. Together they bring many years of vinegrowing and winemaking experience here in California and abroad. Our best (and only employee) is Kathi B. Tyler, our assistant winemaker who shares our goal to make the best wine our vineyards have to offer. 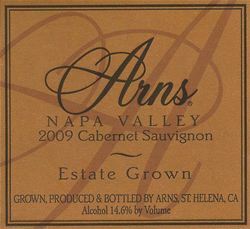 Arns makes long term aging Cabernets that has received great reviews locally and afar. Our quality is in the glass. Walk the vineyards and learn about pruning methods and cultivation practices. We have a scenic view of the western hills. Children usually find their own way of playing. Tasting with the winemaker on the crush pad. We offer 10% discount for Napa Valley residents and 30% discount to those who are industry related.